We slept well at the high aire before descending through some lovely green countryside and small villages before reaching the main road. The drive into La Lina was through a fairly run-down part of town, before we turned off to park in the marina, with a view of Gibraltar behind us and some very sleek floating gin palaces in front. It was a hot, still day. Cathy spent a couple of hours in getting the washing done and dried (or semi-dried) in the marina laundry, The dryer was rubbish so Nido ended up looking like Widow Twanky’s parlour, with washing hanging from every available space. We took a walk into town, showing our passports at the border into Gib and walking across the runway. Gib has changed beyond all recognition, with land being reclaimed from the sea and then built upon - lots of high rise apartments and office buildings, occupied by online gambling companies trying to avoid UK tax and others providing offshore financial and legal services. 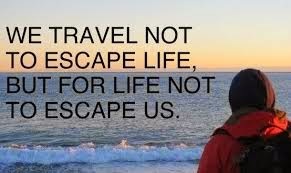 It’s a really busy, noisy, over-populated place, but it still has a sentimental hold on us. Cathy lived here for short periods when her sister’s husband was in the RAF out here. During my time in the Royal Navy, Gib was pivotal in some important aspects of my life. It was my first ever foreign ‘run ashore’ at the tender age of 17 and later that year I celebrated my 18th birthday here, starting at 0600 with the Rock Race - a running race to the top of the Rock starting at the Clock Tower in the Naval Dockyard - and finishing very messily in Loopy’s Bar (which is long gone). 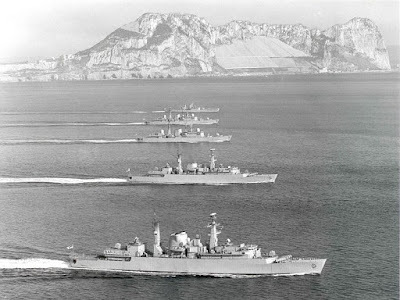 I also sailed from here to the Falklands War (more of that below) and spent several months in and out of Gib when the Logistics Officer in HMS WESTMINSTER in 2003, then we protected shipping passing through the Strait of Gibraltar on the way to support Gulf War 2. So despite its tackiness, Gib holds a special place in our heart. We had a wander down main street, stopping for a beer at The Horseshoe pub (affectionally known in ‘jack speak’ as ’The Donkey’s Flip Flop’) before eating at one of the restaurants in Casemates Square. We did some grocery shopping on the way back to the van, ready to move on tomorrow - Gibraltar done. 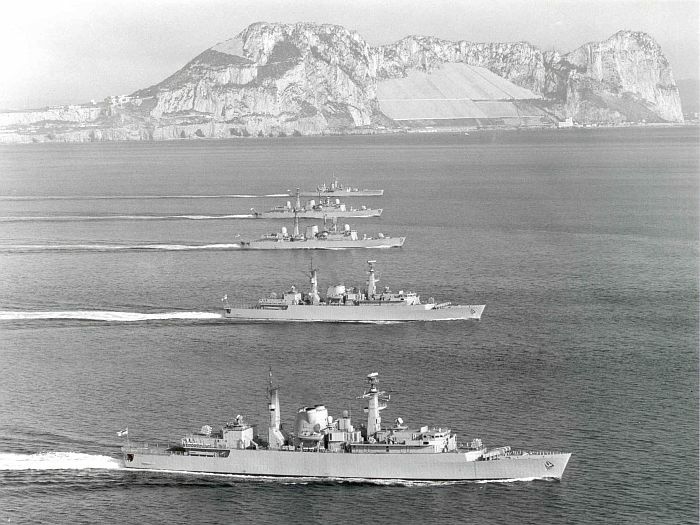 Exactly 36 years ago, I sailed from Gibraltar in HMS BRILLIANT. On this day 36 years ago, as we enjoyed the pubs and bars in town, our Commanding Officer - Captain John Coward - was summoned to the Admiral’s Office. He was informed that intelligence had been received that the Argentinians were planning to invade the Falkland Islands. He was tasked to sail as soon as possible and make all speed to the Ascension Island in the south Atlantic and to wait until a Royal Fleet Auxiliary (RFA) to catch up to supply us with fuel, food and ammunition. We now know a Swiftsure Class submarine had just left Gibraltar and was already on its way. A shore patrol from the shore base - HMS ROOKE - was sent around all the bars and clubs…”Are you off the BRILLIANT?” “In that case get your arses back onboard, you’re under sailing orders.” We just thought this was part of the Exercise SPRINGTRAIN we’d just completed, or perhaps it was punishment for the trouble caused in town by some of our more ‘boisterous’ shipmates! It was only later on the 29th, after quietly sailing (having first taken part in the Rock Race) and when we were well at sea and steaming south, did the CO come on the main broadcast and tell us what was happening. 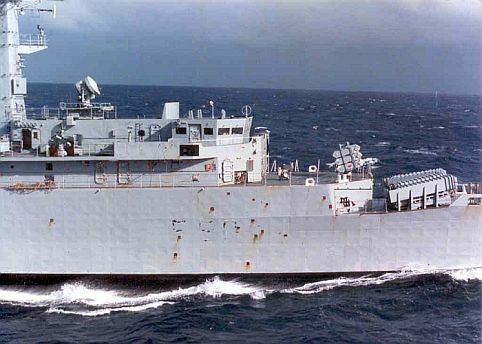 This made us the first warship to sail to the Falklands War, the first to spend more than 100 days continuously at sea since WW2, the first to fire missiles in anger. The rest is history. It’s been a day of memories. Stood at the bar of the Donkey’s Flip Flop today, looking at all the RN caps, badges and crests, brought it all back. The subsequent weeks and months changed my life forever and still now I think of those I drank with in Gib over those few days in late March 1982, who never returned and forever remain on patrol. RIP Shipmates. The Donkey's Flip Flop - it's not changed much in 26 years! A fascinating personal history. My brother in law was army and there, but never spoken about it. Thank you for sharing.